Born on the 4th of July 1967 into a military family, MGen Rouleau grew up in various locations including Montreal, Quebec City, Quetta Pakistan and Ottawa before joining the military in 1985. General Rouleau’s career is roughly evenly split between duty in the Canadian Army, Special Forces and strategic Staff portfolios at defence headquarters. 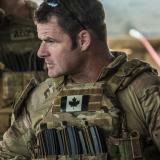 He has commanded Canada’s Special Operations Forces Command since February, 2014; responsible to the Chief of the Defence Staff for the provision of kinetic and non-kinetic counter terrorism and special forces effects domestically and around the globe. General Rouleau’s service in SOF began in 1994 with Joint Task Force 2 (JTF 2). A badged Special Operations Assaulter, he has commanded from troop to unit including deployed Task forces and teams (Afghanistan, Balkans, Africa). General Rouleau retired from the CAF, serving as an Ottawa Police Service emergency response officer from 1999-2002, and re-enrolled as a result of the events of 9-11. His decorations include the Governor General’s Commendation (Sarajevo 1992) and Meritorious Service Cross (Afghanistan, 2007) and he was inducted as an Officer in the Order of Military Merit in 2013. He has a Bachelor of Arts (political science), a Masters in Defence Studies and a Master of Arts Degree in Security, Defence Policy and Management. He is also a graduate of the Senior Executives in National and International Security program at Harvard University (2015) and a Fellow of the US GOFO Pinnacle Program, 2016. Check out the incredible speaker line-up to see who will be joining Major-General Mike.